Holding quality companies over the long term is a winning strategy. Even during some of the worst decades in the U.S. stock market (like the time period from the tech bubble crash in the early 2000s to the financial crisis of 2008), winners can be found if investors exercise patience. For some up-and-coming stocks, though, holding for years can mean returns that far outpace that of the broader stock market. It's all about finding names that are benefiting from long-term trends in the business world, and then giving them time to do their thing. Three such candidates are Teladoc Health (NYSE:TDOC), Splunk (NASDAQ:SPLK), and Veoneer (NYSE:VNE). Here's why three contributors think they have a year's worth of clear skies ahead of them. Nicholas Rossolillo (Teladoc Health): Health care provider Teladoc is on a tear this year. The stock is up 84% as of this writing after pulling off of all-time highs that had its year-to-date return reach as high as 140% over the summer. The reason? The leader in phone- and internet-based health has been growing revenues at a fast pace -- up 41% over the last 12 months -- as it adds new insurers, employers, and participants to its platform. A compelling advantage Teladoc has over its competition isn't just its size; it's also the only comprehensive virtual healthcare provider that spans the globe. Teladoc has expanded its portfolio of services both organically and through acquisition, covering everything from general medical treatment to mental health to pediatrics and everything in between. Teladoc even boasts virtual-assisted lab testing, oncology, and medical triage. Teladoc's technology-driven platform helps save money, is convenient for patients, and is creating better patient outcomes -- all much needed in today's complicated and expensive healthcare landscape. Besides a shakeup of the status quo, Teladoc has something else going for it: It's still small potatoes. Its market cap is only $4.8 billion even after this year's big run-up, and trailing one-year revenues are at $329 million. Full-year 2018 revenues are expected to clear $400 million, though, showing that the days of fast growth are still here. Total paid membership is just under 23 million, and quarterly doctor visits and consultations barely clear half a million. That is a tiny fraction of the global healthcare industry. With momentum building for Teladoc's tech-enabled services, this company should be a lot bigger in a decade than it is today. Chuck Saletta (Splunk): The internet provides a wealth of data and information. There's so much out there -- and still being generated, in fact -- that that the demand for storage is expected to continue growing on an exponential pace for at least the near-term future. Collecting it and storing it is one thing, but what really matters is what you can do with all that data. That's where Splunk shines. A leader in aggregating, analyzing, and driving insights from data , Splunk helps companies make sense of their data and then leverage it to operate more effectively. It does so using artificial intelligence and machine learning, giving it the opportunity to quickly adapt its tools and processes to new situations. Splunk is so well regarded in its ability to turn data into insights and insights into actions that it's actually used to protect America's nuclear security at Sandia National Laboratories . Despite the fact that it has established itself as a leader in AI, machine learning, and leveraging data to help companies make better decisions faster, Splunk still has growth opportunities ahead of it. Analysts expect it to earn $1.10 per share in 2019 and to be able to compound its earnings at around a 35% rate over the next five years . That it's an already established leader with so much opportunity gives reason to believe that the next decade could provide some spectacular growth for Splunk. 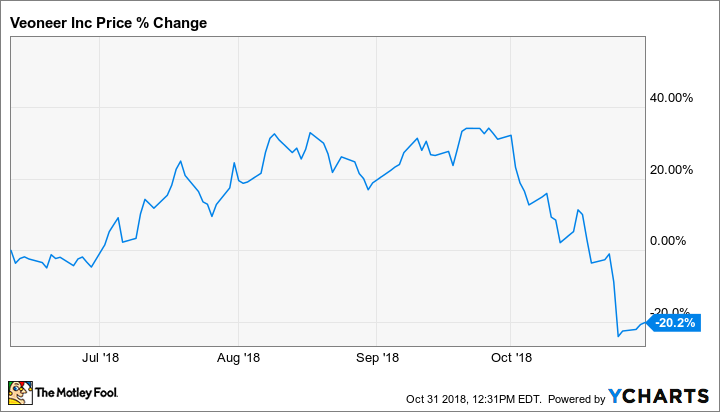 Daniel Miller (Veoneer): It's been a tough October for Veoneer investors who have watched the stock price spiral lower. While the plunging stock price looks bad, the truth is simply that investors were still figuring out how to value the stock after its Jun 29, 2018 spin-off from Autoliv. The spin-off was a smart move and enables Veoneer to focus on driverless car solutions, but it also sent the stock into overvalued territory. Even after the recent declines, Morningstar.com still has Veoneer pegged at a 36% premium to its $24 fair value estimate. The recent decline came after management dropped a couple of gloomy notes during the third-quarter conference call. Production delays, harsher regulations, and slowing demand sent management's full-year sales estimates from a 3% decline to a steeper 5% decline. Management also noted the company was unlikely to hit its $3 billion sales target for 2020. But there was a silver lining in the bad news: Although Veoneer might miss its 2020 sales target, management actually sees upside to its $4 billion-by-2022 sales target. The upside to its 2022 target is based on the strength of its active safety portfolio -- think radar, cameras for driver assist systems, night vision, and other positioning/restraint systems -- which is expected to be the growth engine of the company. Its portfolio is positioned to thrive as the average active safety content in each vehicle is expected to jump to $225 by 2025. That's five times the current average value. Driverless cars are coming, and the need for innovative solutions to design and produce them will be in high demand. Veoneer recently hit a speed bump and might take a little longer to reach its growth goals, but as the active safety content in each vehicle increases, the company is definitely poised for huge growth over the next decade and longer.